The yearly tradition of manatees Buffett and Hugh picking the winner continues. Hugh the manatee is betting that the New England Patriots will win this year's Super Bowl. 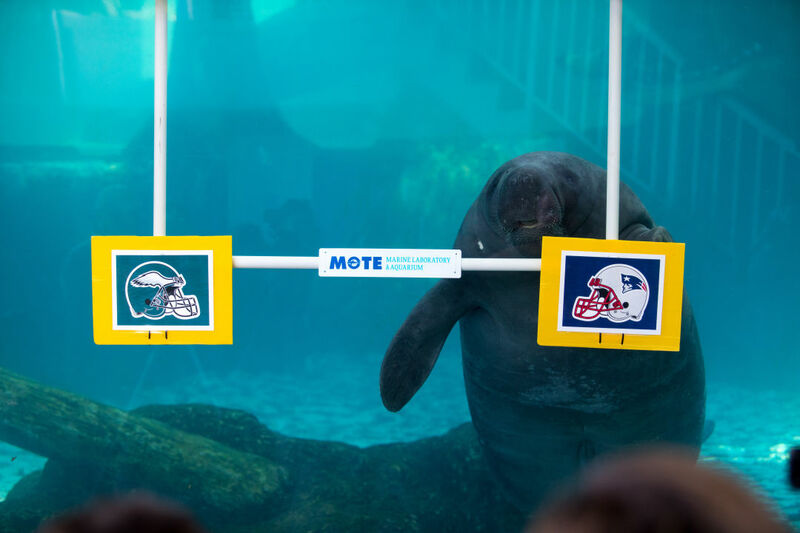 2018 will mark the 11th year that two of Mote Marine Laboratory & Aquarium's beloved manatees predict the Super Bowl winners. Traditionally, Mote's manatee trainers hold a target with a picture of each team and, after being called to the targets, the manatees choose the winner. Shelby Isaacson, public relations manager at Mote, says everyone thinks Buffett, who's 30 years old, is the bigger sports fan of the two because he has correctly chosen the winner 80 percent of the time. Hugh, who is 33 years old, has a 60 percent accuracy rate. Both manatees have lived at Mote since 1996. So, based on the manatees' predictions, who is winning the Super Bowl this year? Well, the results went straight down the middle. Buffett chose the Philadelphia Eagles target, while Hugh chose the New England Patriots. But either way, both teams have an adorable fan on their side.